Hasnt been run since 2014. 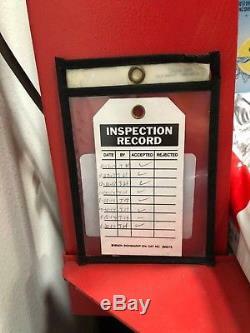 Used recently and works great. 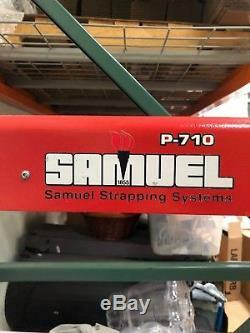 P 710 Samuel Arch Strapping Machine is operator friendly with a self correcting, re-feed system that can resolve mis-feeds quickly even without an operator's help, allowing for time to be saved. 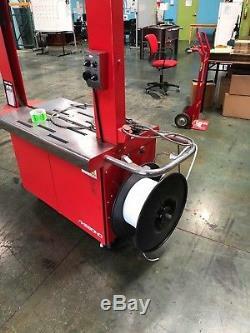 Specially designed for smaller packages, the Samuel P-710 Strapping Machine can use 3/8" or 1/2" poly strapping and comes standard with a roller top in feed table for easy package loading. The Samuel P-710 features a compact sealing head with few moving parts. Complete with an electronic tension control system including a direct drive tensioning wheel. This design has made the machine one of the most robust in its class, reducing maintenance and keeping up high productivity levels. If your operation doesn't need a large arch strapper, please take a look at our Tabletop Banding Equipment that offers portability, a smaller size and less initial expense. 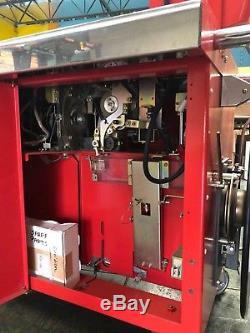 Please note that the strapping sizes and part numbers referenced are required for this machine to run properly. Accepts 1/2 or 3/4 inch strapping. Best for up to 40 cycles a minute. 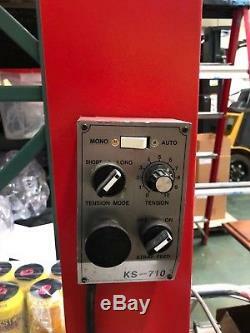 The item "P-710N Samuel Narrow Head Strapping Machine" is in sale since Monday, November 26, 2018. This item is in the category "Business & Industrial\Material Handling\Packing & Shipping\Filling & Sealing Machines\Strapping Machines". 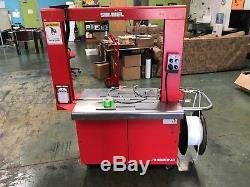 The seller is "dromo166" and is located in Carlsbad, California. This item can be shipped to United States.